As a developer when you work with WordPress, you might find yourself in a situation like, not having the login credentials for the admin user, trying to recover a hacked WordPress site or you are locked out of your administrative account. If any of these happens or could be any other reason, you will need to create a new WordPress user (with an Administrator role) to regain access to the dashboard. 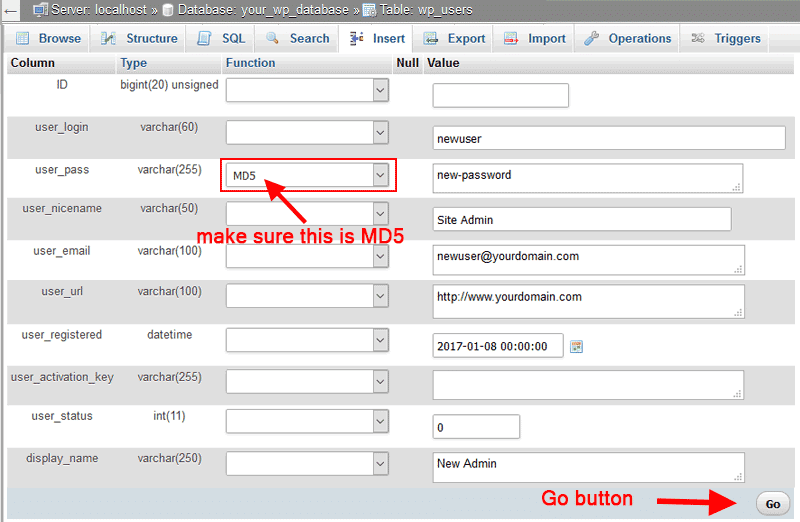 In this post, I will show you how you can manually create a WordPress Admin User via MySQL Database Using PHPMyAdmin. Note: Must have access to cPanel/Hosting Control Panel of the site. Ask the web site owner for the details of cPanel login. Also, make sure to backup the database before making any MySQL edits. After the database information loads Find and click on the WP Users table (assuming database table prefix is set to "wp_"). user_login – insert the username that will be used to access the Admin area. user_pass – type a password for the username. Make sure MD5 is selected in the Function column. user_nicename – (optional, can be added later) type a URL-friendly name for the user. user_email – type the email associated with this account. user_url – (optional, can be added later) this would be the URL to your website. user_registered – set the date/time for when this user is registered. display_name –(optional, can be added later) put the name you like to display for this user on the site. Click the "Browse" tab to verify that the new user record has been inserted correctly (see screenshot below). Take a note of the newly created "ID" field value (this ID field’s value will be use in the next step). Here the ID is 2. In the final step, we will assign some user meta values to wp_usermeta table for the user account that we have we just created. So, click on the wp_usermeta table and click on the Insert tab, just like we did in the previous step.We will add the following two meta value in this table. user_id – this will be the same ID of the user from the wp_users table, which is 2.
meta_key – this should be wp_capabilities (assuming database table prefix is set to "wp_"). meta_key – this should be wp_user_level (assuming database table prefix is set to "wp_"). Finally, click on the last Go button. You have successfully created a new WordPress user with an Administrator role. Now you can visit your WordPress admin login page and use the specified username and password to log in. Once you logged in, you must go to user edit screen to change the password of the newly created user or simply click on the Save button which will allow WordPress to go through and optimize the information. Before executing the following queries you may need to change the "wp_" table prefix (including 'wp_' in 'wp_capabilities','wp_user_level') to match your configuration. After executing above query you will get the "ID" (user id ) and before executing the following query you must replace user_id (3) with the 'ID' number in the following query. My blog was hacked (Russians again) and just about destroyed with a redirected URL. Once the text was identified, the site disappeared. It is currently blank. My own logins, both for the cpanel and for WordPress, were deleted. I am now at the mercy of strangers to rebuild it piece by piece. Thanks to you I can now log into the WordPress blog, where, even if they have disappeared from view, my writings remain. I had followed several instructions, which did not work. I would make one suggestion: I think I am a bit denser than usual, but making a bit clearer that the ID entry is the record number of the record in the wp-users database would be helpful. This was a great article with lots of good examples and resources. Really is very nice. Thank you very much. This is something helpful to create admin user via phpmyadmin. 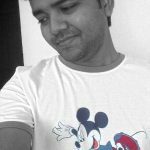 I know one more method via phpmyadmin but a little bit similar to your one. Anyways thanks for this great information.